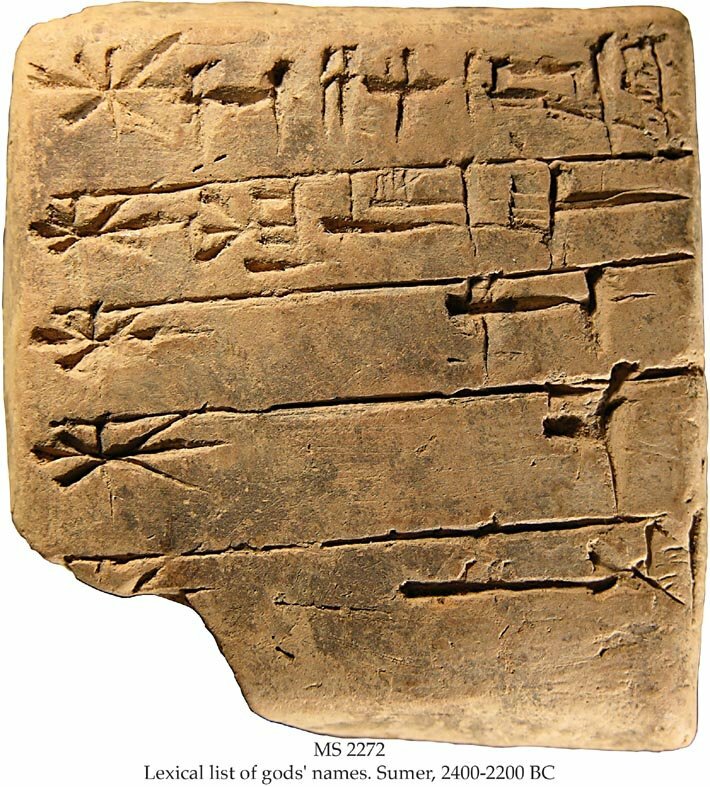 Description	 MS in Sumerian on clay, Adab or Umma Sumer, 2400-2200 BC, 1 tablet, 9,8x9,8x2,5 cm, 4,7x4,4x1,7 cm, single column, 5+5 lines in cuneiform script. Binding	 Barking, Essex, 1998, blue cloth gilt folding case by Aquarius. Context	 Other tablets with Gods' names, are MSS 2200/318, 2200/321, 2200/332 and 2422. Commentary	 This is clearly the beginning of the list, since Enlil, god of the town of Nippur, was the practical head of the pantheon at this time. The Sumerian, Babylonian and Assyrian religions had thousands of gods, hence extensive lists to keep track of them. No other copy of this particular list is so far known. Published	 Mentioned in: Miguel Civil: The Lexical Texts in the Schøyen Collection, Cornell University Studies in Assyriology and Sumerology, vol. 12, Manuscripts in the Schøyen Collection, Cuneiform texts V. CDL Press, Bethesda, MD, 2010, text 8.6, p. 284. Image featured in	 Zondervan Illustrated Bible, Backgrounds, Commentary. John H. Walton, gen. ed. Grand Rapids, Mich., Zondervan, 2009, vol. 3, p. 229.